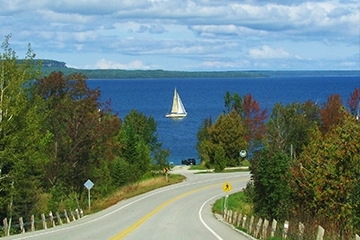 Located just a few Hours from Major Ontario Cities & Centres, Georgian Bluffs is a Collection of Communities Stretching North from Chatsworth to just South of Wiarton. Copper Kettle, Cobble Beach, Springmount, Big Bay, Oxenden, Balmy Beach…these are just some of the Names that Paint a Picture of the Georgian Bluffs Canvas, along the Georgian Bay Coastal Route. The Township of Georgian Bluffs has Eight In-land Lakes & Miles of Shoreline on Georgian Bay. Many of These Lakes have a Public Access & Offer Great Boating, Fishing, Canoeing, Kayaking, or Swimming. If These Activities are Too Tame for You; Stop Off at Cedar Hill Park & to Get Adventurous with some Scuba Diving or Snorkelling in Colpoy’s Bay! Easily Launch Your Sailboat or Yacht from one of the Local Marinas. For Those that Want to Hike & View Nature a Little Closer, There are Many Conservation & Management Areas throughout the Township. The Niagara Escarpment Winds Through the Township affording Scenic Vistas, Hiking on the Bruce Trail & Hours of Enjoyment for the Naturalist, Photographer or those Seeking a Scenic Driving Tours. Self-Guided Waterfall Tours (Indian, Jones & Inglis Falls), Rural Garden Tours, & Stunning Artesian Studio Tours are offered here. Hikers, Bicyclist, & Horseback Riders can also Enjoy the Georgian Bluffs Trail from Owen Sound to Park Head and on into Bruce County, for Endless Hours on the Beautiful Bruce Trail. Don’t get us Wrong, Life Here isn’t Put on Hold During the Winter Months! The Area has Plenty of Snow-Covered Opportunities to Take Advantage of, too! This is Canada after all! J Locals & Tourists alike Feel that some of the Best Ways to Take in the Majestic Winter Scenery is to Partake in: Snowmobiling, Cross-Country Skiing, or even Snowshoeing One of Our Many Trails. For the More ‘EXTREME’ Enthusiast, Try Caving at Bruce’s Caves, Mountain Biking or Hiking on the rugged Bruce Trail, and climbing Skinner’s Bluff overlooking the Slough of Despond or through one of the many Conservation Areas throughout the Township. Interested in learning a bit more about the area? County heritage and cultural traditions display as well as the Morestown Heritage Village at the Grey Roots Museum & Archives. A café and visitors information centre are also available as well as a collection of locally inspired films. Georgian Bluffs is Home to a Wonderful Variety of Unique & Special Properties. From Log Homes with Acreage, to Waterfront Dream Villas, there is Truly Something for Everyone’s Taste Here! Understanding the Local Market Conditions of Georgian Bluffs & It's Many Lovely Areas is Important When it Comes to Buying & Selling Real Estate. When it's Time to Buy or Sell Your Dream Home or Cottage, Call Our Team! Get an Agency on Your Side Who Has Experience with the Local Georgian Bluffs Market. Reach Out to Us Today so We Can Introduce You & Your Family to all that Georgian Bluffs has to Offer!